Kjell is the son of Sandy White and her husband Gregor Busshoff of Neuss, Germany. 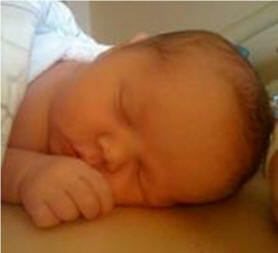 Kjell was born October 6, 2011 at 11.39 am, weighed 9 pounds 13 ounces and was 22 inches long. His father Gregor, the son of Magdalene & Georg Busshoff was raised in Bocholt, Germany. Kjell’s mother Sandy was raised in New Jersey in the USA. Her mother Peggy Kemp was also born on October 6. Peggy passed away in 2002. She would have been so proud of her new grandson and especially that he was born on her birthday. Kjell is the great, great, great grandson of Yankee Pat Tinneny of Goladuff, Newtownbutler, County Fermanagh, Ireland, Greenock Scotland and Philadelphia, Pennsylvania.